In an admission of wrongdoing, state and federal governments on Thursday apologized to Alaska Natives for a decades-long ban on spring migratory bird hunting that overlooked the value of the hunts in villages but wasn't overturned until 1997. "On behalf of the U.S. 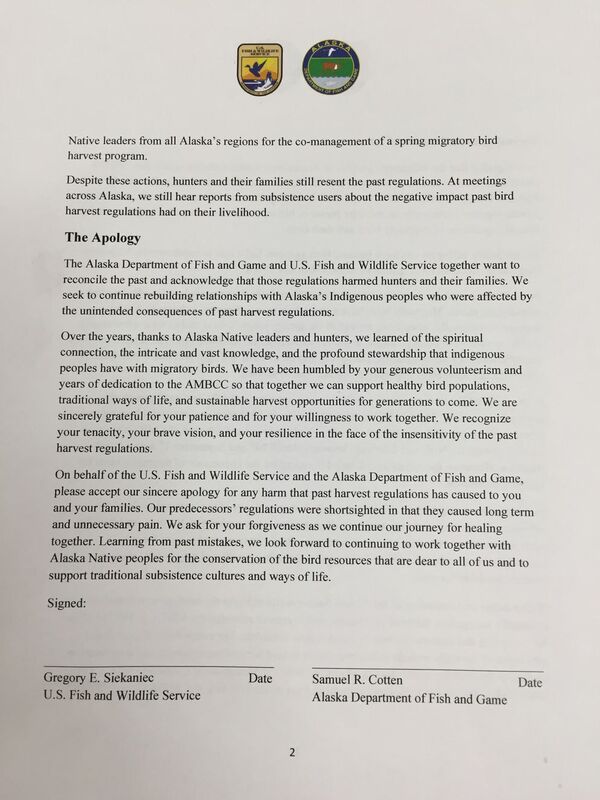 Fish and Wildlife Service and the Alaska Department of Fish and Game, please accept our sincere apology for any harm that past harvest regulations has caused to you and your families," said Greg Siekaniec, Alaska region director for U.S. Fish and Wildlife Service. "We recognized that the regulations were wrong, that they prohibited hunting of migratory birds when you needed it most during the springtime," said Sam Cotten, commissioner for Alaska Department of Fish and Game. "We got it wrong. We regret that. We caused harm. We're happy that's been resolved." The concession came in Anchorage at a crowded, emotional meeting of the Alaska Migratory Bird Co-Management Council, a Native, state and federal group that manages the subsistence hunts today. The problems arose from implementation of the Migratory Bird Treaty Act in Alaska in the 1960s and 1970s. Game wardens cited and arrested Alaska Natives for hunting ducks and geese during closed seasons, seizing rifles, people at the meeting said. In more recent decades, as the law's impacts in Alaska became clear, authorities turned away from enforcement and focused on educating hunters to help protect struggling bird populations. Gayla Hoseth, an Alaska Native representing the Bristol Bay region on the council, said village residents were forced to hide from officers to hunt for survival and practice age-old traditions. She wiped tears with a tissue after the apology was read. "We have people come into our areas and tell us our ways are wrong. People being criminalized, guns confiscated. The part that really gets to me … for people to hide and pluck birds to feed their families. Imagine you're trying to feed your family and (imagine) that feeling people have throughout the state of Alaska." The arrest of a local hunter in 1961 sparked the famous "duck-in" protest in Barrow, the community now called Utqiagvik. That May, a group of 138 men, women and children presented their harvest of 138 ducks to the federal game warden, all asking to be arrested for subsistence hunting. Exactly how many Native hunters were cited over the years, and how many guns were confiscated, officials couldn't say Thursday. The state was in the wrong by helping implement and enforce the law with its game wardens, Cotten said. The ban, tied to international conventions that included Canada and Mexico, lasted from March 10 through Sept. 1 annually to protect birds and eggs during nesting season. But that was the only time in many Alaska villages when the food was available. The ban began each year as caches were running low on meat following long winters, according to a video explaining the apology. People were arrested for killing a single duck, said Raymond Stoney in the video, taped before his death in 2017 at the age of 82. "They told me, said, 'Your father got duck today. If you have a bowl of soup, you are under arrest," Stoney said. The former Kiana resident in Northwest Alaska called for the apology in 2015, leading to the concession. "'I'm taking your shotgun.' And they took all these guns. That's what we experienced, our parents did," said Stoney. Other Alaska Native leaders sought changes to the law and apologies, said Randy Mayo, representing Interior villages on the council. Mayo said he'll take his copy of the apology — signed by Siekaniec and Cotten and presented to Alaska Natives on the council — to the Tanana Chiefs Conference in Fairbanks, the tribal consortium for 42 villages. "This is a monumental milestone on behalf of the people who put a lot of effort into this, some people who are no longer with us," he said. Getting terms of a treaty altered is a long process, with support from other countries and congressional approval needed, said Siekaniec. With input from Alaska Natives, agencies began to understand the problems the law caused in villages, Siekaniec said. Around the 1970s, wardens began focusing on educating Native subsistence hunters on topics like avoiding struggling bird populations, or using non-lead shotgun shells to protect the environment, he said. The act was amended in 1997 to allow the subsistence harvest, following pressure from Alaska Native leaders. The first legal hunt wasn't held until 2003. More than 200 villages rely on the hunts each year. About 163,000 migratory birds were taken by Native subsistence hunters last spring and summer, less than 1 percent of the nationwide harvest, said Patty Schwalenberg, executive director of the council. Christopher Tulik works for the Yukon-Kuskokwim Delta National Wildlife Refuge with offices in Bethel. He travels to dozens of villages in the Southwest Alaska region, distributing information about hunting and fishing policies to residents. Many residents still harbor resentment over the government's oversight, he said. "I'm very happy about the apology," he told the council. "The people in the villages will accept the apology, but it will not happen overnight."